The story goes that the pasta was inspired by the navel of the goddess Venus. Supposedly, the beautiful woman and Zeus, after having been in a battle between Bologna and Modena, stay at an inn at a small town outside of Modena. Later, after a hearty dinner with much wine, they decide to share a bedroom. The innkeeper was so captivated by them that during the night he peeks through the keyhole of their bedroom door, and all the innkeeper can see is the navel of Venus. This vision mesmerizes him, causing him to rush to his kitchen and create a pasta inspired by Venus' navel. There you have it, the creation of tortellini! 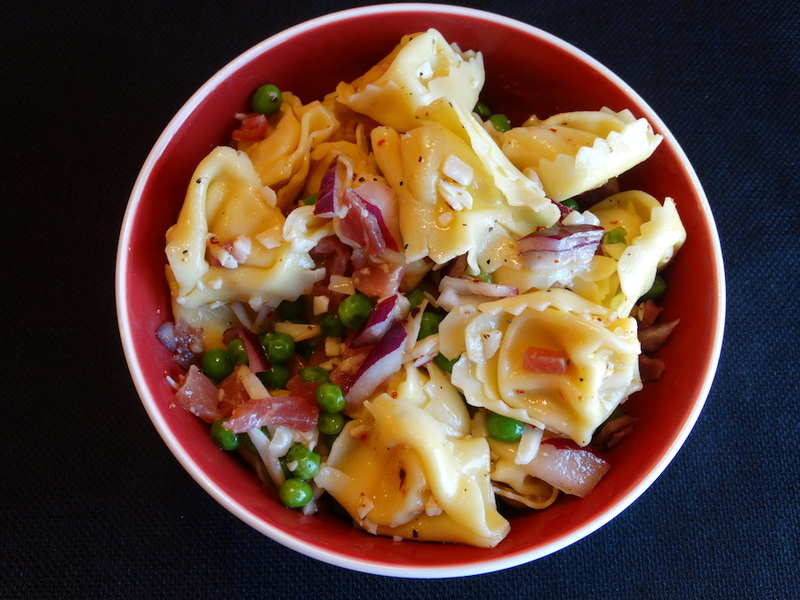 This tortellini salad is all about a variety of textures with great flavors. It's surprising how well the zippy vinaigrette and pasta, vegetables and seasonings all blend together. Do not cook the frozen peas, either defrost in the microwave or drain the hot pasta water over the peas in a colander. The latter method works well, saves time and keeps the peas crisp. Use a good quality olive oil and add more if needed, adjust seasonings accordingly. 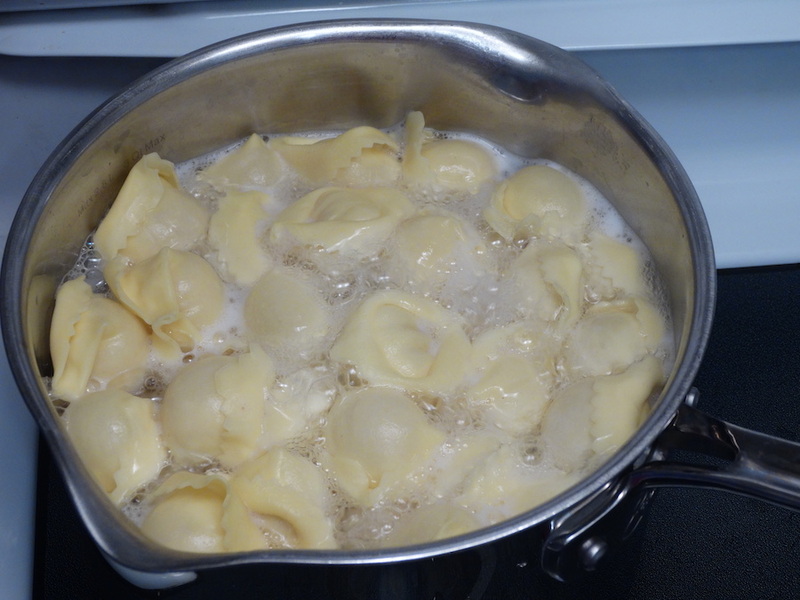 Prepare tortellini per package directions, place in colander, run cold water over all and drain well. Microwave the peas until thawed. In a small mixing bowl, whisk the oil, and vinegar well. Add garlic and oregano; stir in honey, salt and pepper. 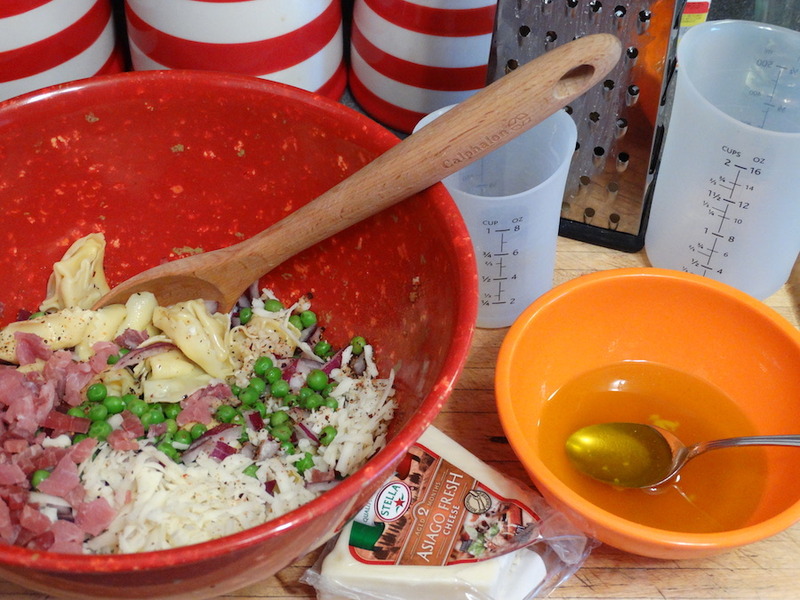 In a large bowl, combine pasta, peas, prosciutto, onion and Asiago cheese.
" ...love at first bite.." - I love that. Tortellini, fagottini, sachettini, ditalini...anything from the 'cucina italiana' is delicious and worth a try in the kitchen. Looks like an ideal summer meal - I love pasta salad. I do too, Larry. Thanks! That's a fun story :-)) The salad looks awesome with the combo of flavours and colours, Pam. Love the tale! This makes my mouth water! Thanks, Anne! Lots of good flavors in it. Thanks, Diane! Hope you have a great weekend! Intersting little story.....one that I have never heard before, but doesn't it all make sense. Love me some tortellini. Thanks, Shug! I love tortellini! What a delicious meal Pam! Definitely my type especially now that is summer! I always say salads are the best summer meals! Thanks, Katerina! Summer salads are so good, this would definitely make a meal for me. 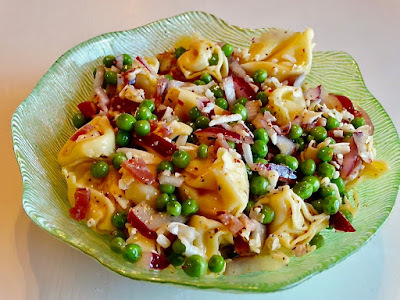 I've had various pasta combos with peas and ham, loved them all, and think this is a good one. The story is amusing but has some flaws -- for one thing, Zeus is the Greek king of the gods and Venus is Roman. Also, he's her father. Whatever. A version of that story using her Greek name Aphrodite does appear in "The Encyclopedia of Pasta," though in this one it's just the goddess and the landlord who's a peeping Tom -- no mention of Zeus. 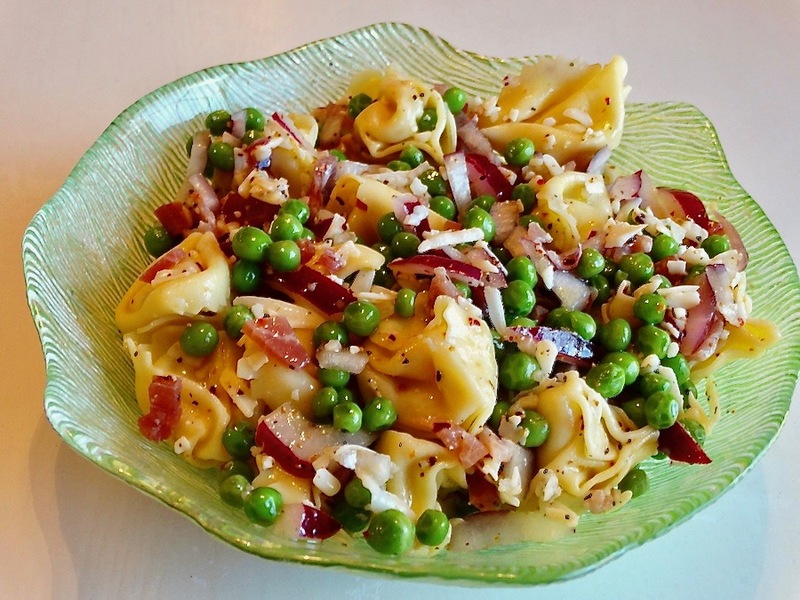 This looks wonderful -- love peas in pasta. I almost always use pasta, and usually add them to the pasta water right before draining. Your method is similar but easier. Good stuff -- thanks. Tortellini always my favourite especially in creamy mushroom sauce. Thanks for sharing the lovely story.